New pacemakers cost $10,000 - $30,000. The poor in countries outside the USA usually go without. Millions of the poor outside the USA die each year for lack of a pacemaker. We annually donate hundreds of free cardiac pacemakers to the poor in Africa and in developing countries in other parts of the world. These pacemaker donations save lives. But pacemakers cannot be surgically implanted unless the hospital has X-Ray equipment called a "C-arm." We are raising $100,000 to buy C-arm X-Ray machines for two (2) hospitals in Africa, one in Niger and the other in Cameroon, that need them to implant our free pacemakers. Northeast Scientific is Raising Funds to Supply two refurbished Operating Room 'C-arm' X-Ray systems to hospitals in Cameroon and Niger. Our dedicated team of business professionals and physicians is committed to saving the lives of the sick and the poor of Niger, Cameroon, Kenya and other African countries. We do it by providing pacemakers and related medical supplies and services to the needy poor of those countries free of ANY charge. What is 'C-Arm Fluoroscopy' ? What does the C-arm have to do with donating free pacemakers? · A 'C-arm' fluoroscope is an X-Ray device used by a physician to guide pacemaker lead wires to a specific area of the heart while watching that wires on a live x-ray screen. In the third world, hospitals often limit the kinds of surgery they perform because they lack this kind of X-Ray technology in the operating room. In addition to facilitating the implantation of pacemakers, the C-arms provided to these two African hospitals will also facilitate other kinds of surgery requiring a state of the art C-arm. Physicians are at the ready to implant these pacemakers, free of any charge, into scores of the poor, sick and needy of Niger and Cameroon. They are inhibited or stopped completely from fulfilling this mission because the hospitals serving those countries are not properly equipped to perform pacemaker implantation. Two hospitals, one in Cameroon and the other in Niger each need operating room x-ray systems known as a “C-Arm” to perform the surgery. It’s called a “C-Arm” because the machine is in the shape of a big letter “C” with the X-Ray emitter at the top of the C and the receiver plate at the bottom of the C-Arm. 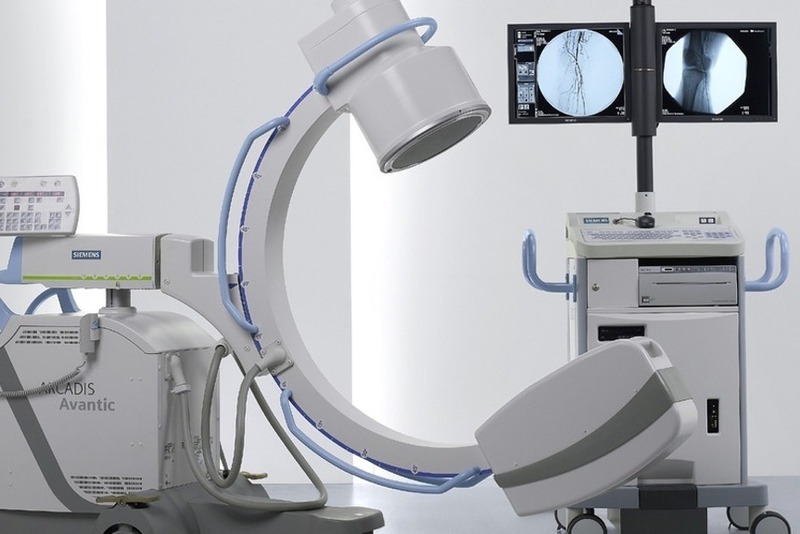 New operating room C-Arm X-Ray systems and related accessories cost $100,000 or more each. Reconditioned C-Arms, the kind we want to purchase and donate to hospitals in Cameroon and Niger, cost around $40,000 each. The money raised here will be used to purchase a refurbished C-Arm, spare parts, crating and shipping to Cameroon and Niger and the travel expenses of technicians sent to Cameroon to train physicians and hospital staff on the use, care and maintenance of this sophisticated equipment. And while the C-Arm is needed for implanting the donated pacemakers, the C-Arm can also be used to facilitate numerous other medical and surgical procedures. So the capability of these hospitals, and subsequently the public health situations in both Niger and Cameroon, will be expanded manifold by these C-Arm donations. Craig Allmendinger, CEO of Northeast Scientific, along with Carl Rodia its President, lead a dedicated team in the distribution of reprocessed pacemakers to the indigent poor of The Philippines, Haiti, Nicaragua, Kenya and other developing countries. Powered by the generous support of Northeast Scientific, Inc. of Waterbury, CT, we've worked closely with The University of Michigan’s My Heart, Your Heart and Detroit’s World Medical Relief charities in this life-saving mission of giving. ***Contributors of $25 or more receive an "I Help Save a Heart in Africa T shirt"
***Contributors of $500 or more receive the crystal cube trophy containing a 3 dimensional image of the human heart in addition to a T shirt (See the video, above).